Mastering your ability to deliver a presentation or speech is an essential part of your future success as an employee or entrepreneur. It allows you to promote yourself, make new contacts and provides an excellent platform for sharing your ideas and vision with a broader audience, in conference rooms and event halls alike. Contending with speech fear and anxiety isn’t easy, but it can be done. Tweaking your preparation habits and the way you convey your message, along with an awareness of your audience’s perceptions and expectations, can help you hone the skills of a successful, persuasive and world-class communicator. The psychology behind public speaking manifests itself in subtle ways. Mastering the minutia of what’s happening in the minds of the audience as well as the speaker is essential in effectively sharing your message. 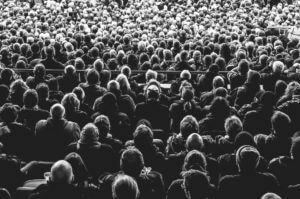 These next few tips will help you captivate and keep the seemingly ever-elusive attention of an audience. In an article for Entrepreneur, contributor Neil Petch noted a famous study as evidence to the power of nonverbal communication. “Dr. Albert Mehrabian, author of Silent Messages, famously conducted research in the early 1970s which found that just 93% of any message is conveyed through non-verbal communication,” Petch wrote. Gestures and gesticulations provide a direct connection to the brain, allowing extra access to memories and ideas, without which it would be considerably difficult for humans to communicate and share with each other. Control your body movements and you have added a layer of control over the audience’s attention. Geoffrey James, contributing editor of Inc.com, features ideas from a former Harvard psychology department chair on how a bit of “razzle dazzle” via visual aids can help your audience retain information. “The latest neuroscience research has revealed that human beings process words and pictures in different physical areas of the brain. If your presentation includes pictures alongside text, people are twice as likely to remember your message,” James wrote. It may take some extra preparation time, but creating an interactive dynamic with an audience will promote far more attentiveness and genuine engagement. Another Entrepreneur guest writer, Jonathan Li, pointed out that you’ll have to fight hard for your audience’s attention. “The scarcest commodity in the business world is attention. If you’re a boring speaker, the audience will check their emails or think about where to have dinner tonight,” Li wrote in 2015. Don’t forget to break interrupt the monotony. Our brains aren’t naturally configured to tune into the drone and lulls of a lackluster speech. However, with a few adjustments, you will improve your delivery and confidence. By setting the right tone of voice, interrupting the audience’s day-dreaming by asking direct questions, and creating emotional connections through personal anecdotes, you are sure to captivate them both with your expertise and your personal, vested interest. It is also important to mention the role of practice and repetition in confidence and connection with an audience. Knowing your material is an extremely necessary component in giving your listeners a reason to feel included. You’ll also connect with them on a deeper, more meaningful level. Having a solid grasp on a pithy, focused speech also frees up extra processing space in your brain so you can spend more energy building a genuine, off-the-cuff rapport and less on giving a tired, uncertain lecture. Embracing the fear of public speaking will go a long way in maintaining a lasting, successful career. World-class communications skills are attainable, not through nervous pacing or breathing into a paper bag, but with an appreciation for communicating your entrepreneurial view. No matter how you dress it up, however, there is no excuse for failing to make use of the incredible spectrum of communication and persuasion tools at your disposal. Break up the rhythm of your speech to aid in the retention of information and get the audience active with methods that nudge them to utilize several parts of the brain at once. Applying these principles will help you overcome your fear of speaking and will create presentations and pitches that engage the audience and, ultimately, lead to your success.